MOSCOW -- Vladimir Putin headed to an overwhelming win in Russia's presidential election Sunday, adding six years in the Kremlin for the man who has led the world's largest country for all of the 21st century. The vote was tainted by widespread reports of ballot-box stuffing and forced voting, but the complaints will likely do little to undermine Putin. His popularity remains high despite his suppression of dissent and reproach from the West over Russia's increasingly aggressive stance in world affairs and alleged interference in the 2016 U.S. election. Putin's main challenge in the election was to obtain a huge margin of victory in order to claim an indisputable mandate. 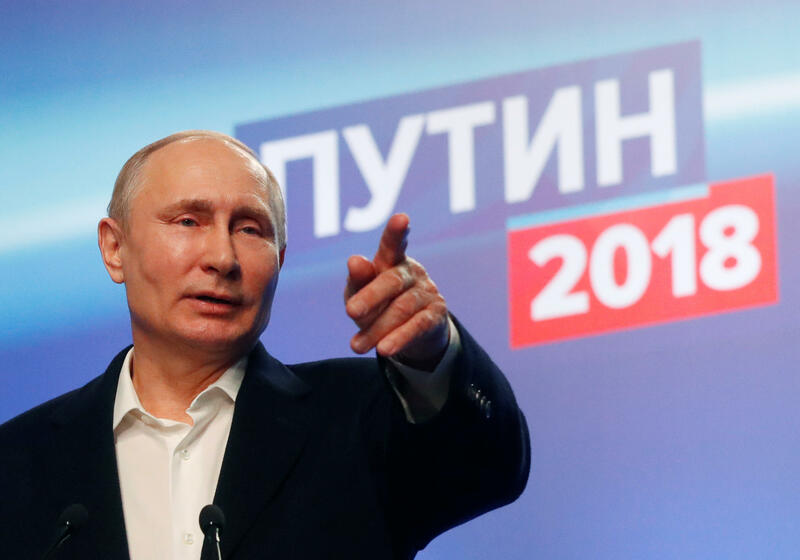 With ballots counted from 60 percent of the vast country's precincts, Putin won more than 75 percent of the vote, the Central Elections Commission said. In a short speech to a throng of thousands of supporters near Red Square late Sunday, Putin hailed those who voted for him as a "big national team," adding that "we are bound for success." Russian authorities had sought to ensure a large turnout to bolster the image that Putin's so-called "managed democracy" is robust and offers Russians true choices. By 7 p.m. Moscow time, authorities said turnout had hit nearly 60 percent. CBS News' Elizabeth Palmer called the race an exercise in "managed democracy." Putin faced seven minor candidates on the ballot. There was one man who might have given Putin a run for his money in this election: Alexei Navalny, an anti-corruption activist who was harassed in the run-up to the election. He was ultimately barred from the race. The election came amid escalating tensions between Russia and the West, with reports that Moscow was behind the nerve-agent poisoning of a former Russian double agent in Britain and that its internet trolls had mounted an extensive campaign to undermine the 2016 U.S. presidential election. Britain and Russia last week announced diplomat expulsions over the spy case and the United States issued new sanctions. Russian officials denounced both cases as efforts to interfere in the Russian election. But the disputes likely worked in Putin's favor, reinforcing the official contention that the West is infected with "Russophobia" and is determined to undermine Putin and Russian cultural values. The election took place on the fourth anniversary of Russia's 2014 annexation of Crimea, one of the most dramatic manifestations of Putin's drive to reassert Russia's power. In his next six years in office, Putin is likely to assert Russia's power abroad even more strongly. Just weeks before the election, he announced that Russia has developed advanced nuclear weapons capable of evading missile defenses. The Russian military campaign that bolsters the Syrian government is clearly aimed at strengthening Russia's foothold in the Middle East and Russia eagerly eyes possible reconciliation on the Korean Peninsula as a lucrative economic opportunity. At home, Putin must face how to groom a successor or devise a strategy to circumvent term limits, how to drive diversification in an economy still highly dependent on oil and gas, and how to improve medical care and social services in regions far removed from the cosmopolitan glitter of Moscow. Casting his ballot in Moscow, Putin was confident of victory, saying he would consider any percentage of votes a success. "The program that I propose for the country is the right one," he declared. Given the lack of real competition, authorities struggled against voter apathy, in the process putting many of Russia's nearly 111 million voters under intense pressure to cast ballots. "But the answer was easy ... if I want to keep working, I vote," he said. He spoke on condition that his last name not be used out of concern that his employer -- the Moscow city government -- would find out. Across the country in the city of Yekaterinburg, a doctor also said she was being coerced to vote. When she hadn't voted by midday, "The chief of my unit called me and said I was the only one who hadn't voted," said the doctor, Yekaterina, who spoke on condition her last name not be used because she also feared repercussions. In Moscow, first-time voters were given free tickets for pop concerts and health authorities were offering free cancer screenings at some polling stations. Voters appeared to be turning in out in larger numbers Sunday than in the last presidential election in 2012, when Putin faced a serious opposition movement and there were violations of multiple voting, ballot stuffing and coercion. Some 145,000 observers monitored Sunday's vote, including 1,500 foreigners, and they and ordinary Russians reported hundreds of problems. Some examples: ballot boxes being stuffed with extra ballots in multiple regions; an election official assaulting an observer; CCTV cameras obscured by flags or nets from watching ballot boxes; discrepancies in ballot numbers; last-minute voter registration changes likely designed to boost turnout and a huge pro-Putin board inside one polling station. Navalny, whose group also monitored the vote, dismissed Putin's challengers on the ballot as "puppets." He urged a boycott of the election and vowed to continue defying the Kremlin with street protests. The Ukrainian government, insulted by Russia's holding the election on the anniversary of Crimea's annexation, refused to let ordinary Russians vote. Ukraine security forces blocked the Russian Embassy in Kiev and consulates elsewhere as the government protested the voting in Crimea, whose annexation is still not internationally recognized. "Who am I voting for? Who else?" asked Putin supporter Andrei Borisov, 70, a retired engineer in Moscow. "The others, it's a circus."